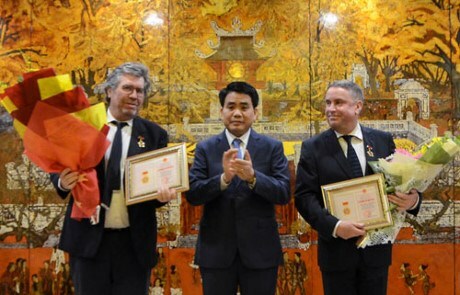 Hanoi (VNA) – The People’s Committee of Hanoi has presented the title of “For the Course of Capital Construction” to two Frenchmen for their contributions to the capital’s development. Michel Drobiniak, Economic and Commercial Councellor of the French Embassy in Vietnam, and Remi Genevey, former Director of the French Development Agency in Vietnam, were also honoured for their efforts in strengthening ties between the two countries. Addressing the presentation ceremony on August 29, Chairman of the municipal People’s Committee Nguyen Duc Chung said that since Drobiniak took office in Hanoi in July 2013, he has worked hard for the city’s growth, especially in transportation infrastructure. Along with helping Hanoi projects access science and technology, he has boosted bilateral ties in many other areas such as infrastructure development, aviation, health care and energy. Notably, he supported Vietnamese and French enterprises to cooperate in areas of common interest, helping Hanoi firms expand business partnerships and export more products to France, he added. Chung also noted that Genevey, who acted as the Director of the Development Agency in Vietnam from September 2013, helped swell France’s total capital commitment to Vietnam to 1.77 billion USD. He also supported a project to install an air monitoring station for the city, said Chung.